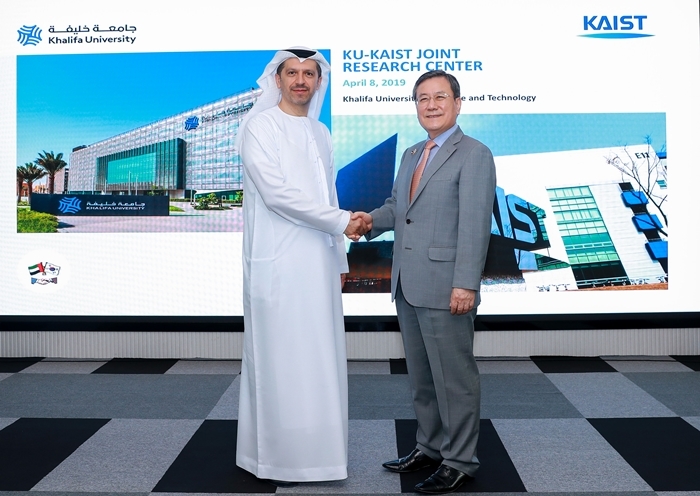 KAIST opened the KAIST-Khalifa University Joint Research Center with Khalifa University on April 8. The opening ceremony was held at Khalifa University and was attended by President Sung-Chul Shin and Khalifa University Acting President Arif Al Hammadi. The new research center reflects the evolution of the long-established partnership between the two institutions. The two universities have already made very close collaborations in research and education in the fields of nuclear and quantum engineering. The launch of this center expanded their fields of collaboration to smart healthcare and smart transportation, key emerging sectors in the Fourth Industrial Revolution. President Shin signed an MOU with the UAE Minister of State for Advanced Science Sarah Amiri and Khalifa University to expand mutual collaboration in technology development and fostering human capital last year. The center will conduct research and education on autonomous vehicles, infrastructure for autonomous vehicle operation, wireless charging for electric vehicles, and infrastructure for electric autonomous vehicles. As for smart healthcare, the center will focus on healthcare robotics as well as sensors and wearable devices for personal healthcare services.